Our company has achieved widespread recognition in providing Solar Water Pumping System Maintenance Service. The electricity tariff and diesel prices are increasing day by day, making water pumping non-viable for farmers and agriculture producers. Jyotitech Solar LLP solar water pumping solutions save your diesel or electricity costs with little maintenance and a long product life. It is reliable and cost-effective. We supplies V-4, V-5, V-6, V-8 Submersible pump, monoblock pump, openwell submersible pump, dewatering pump, Booster pump, Self priming pump, Shallow well jet pump, Auto boost pump, Inline pump, Centrifulgal pump, Fire pump(Hydrant & jockey), Domestic pressure booster system and solar system. We offer service for pumps with outstanding comprehensive solution for pumping machine assuring the performance of pumps. We have one of the best service providers in Pumps who make sure all work is timely completed. Solar energy as a power source for water pumping is an ideal solution in locations where access to grid power is not available or where the grid is not reliable. This system use photovoltaic (PV) cells to convert sunlight into electricity to power DC pumps which can be used to pump groundwater or surface water. 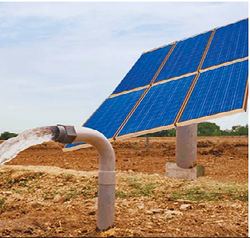 Owing to the wide experience in this domain, we are instrumental in offering Solar Water Pump installation service to our clients. Munaj Electrical ( OPC) pvt. Ltd. Solutions for Agriculture, Drip Irrigation, Bore Well, Running River, Sump to Overhead, Water Treatment Plants – STP/ETP, Horticulture, Floriculture, Apartments, Institutions, etc. Providing Dependable Solar Water Pumping Solutions where it’s needed most.